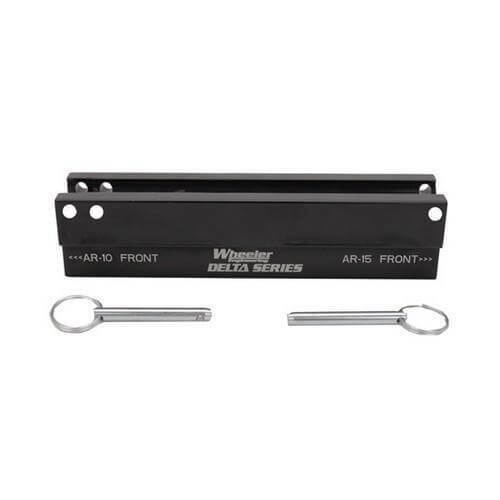 This innovative AR vise block is designed to securely hold basically any AR upper receiver. It will secure AR-15 uppers by engaging the take down lugs on the bottom of the receiver. By reversing the direction it will secure most AR-10 style uppers in the same manner. In addition it will secure any Pic Rail on a hi-rise, standard flat top or many other integrated rail guns by sliding onto and clamping the rail. The durable machined aluminum construction and precise tolerances ensure a secure hold essential for removal and installation of stubborn barrel nuts as well as a variety of other tasks. Great quality, heavy duty. I bought a plastic vise block that's garbage. I replaced it with the Wheeler Metal vise block. It works for both AR-15 and AR-10 uppers.